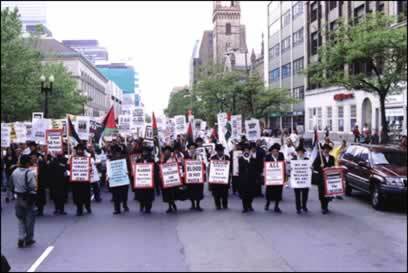 Members and supporters of The Neturei Karta travel to major US cities to demonstrate against Zionism and the so-called State of Israel. It was during the first Intifada that Neturei Karta began its policy of taking to the streets in support of Palestinian rights. The second Intifada found Neturei Karta leaders and lay people traveling up and down the eastern United States in solidarity with the Palestinian people. Demonstrations are listed below in Most Recent Event Date order. To change sorting, click the column heading.